Knead everything together to make a soft dough. Let the dough rest and then roll the it out. Now take some margarine and spread on top of the dough. 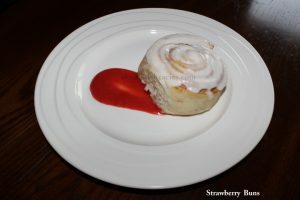 Next spread the strawberry sauce (do not put too much) and fold the dough, then cut into equal parts. Place in a greased pan, spread some margarine on each piece and let them rise. Then bake at 350 degrees for about 20 to 25 minutes or until well done and nice in colour. Remove from oven and add some glaze before plating. Remove from the pan and place them in a plate and add some more glaze and strawberry sauce. In a mixer, add the icing sugar,cream cheese and some milk. In a blender, add the sauce ingredients and blend until smooth.